People can be very creative with their punctuation, whether they use it too much, not enough or in new and wonderful ways. 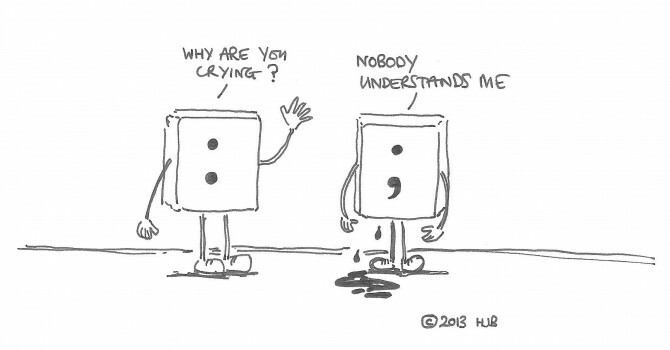 Colons and semicolons often bear the brunt of this. I’m not one of those people who’s averse to using an exclamation mark. I also like commas, apostrophes and all the other types of punctuation. I don’t apologise if this sounds a bit geeky; I write for a living, so it’s right that I have an interest in how to use them to their best effect. So, I’ve just started reading Lynne Truss‘s book, Eats, Shoots and Leaves (2003). It’s been on my mind to get hold of a copy for a little while, as it received quite a mixed reception when it was first published. Okay, it may not be for everyone, but I’m really enjoying it. The book’s a very interesting, curious account of modern-day applications of punctuation and where it all stemmed from.